Few photos from JEMMA PRESS presentation at LEFIK on Friday 30/9/2011. 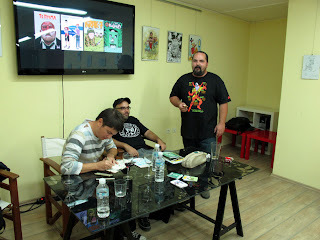 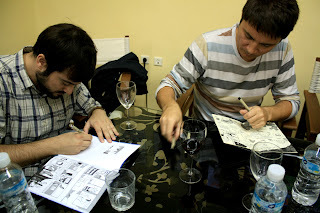 More photos and details you can see at KOULOURI COMICS page on Facebook and at Agiati's blog DON'T EVER READ ME. The last two photos I borrowed from her blog were taken by Lila Tzamousi. "KOULOURI (kind of round bread) for the stomach, HERE. 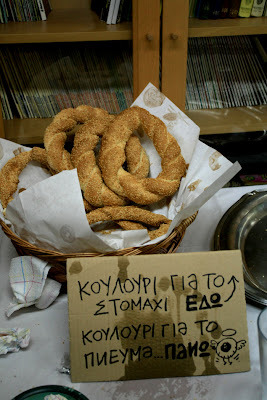 KOULOURI for the soul, UPSTAIRS (where it was presented and you can buy the issue)." 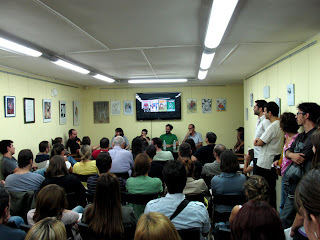 At the same event had presented three other titles by JEMMA PRESS: "KRAK KOMIKS #7" by Tasmar, "IT'S NOT WHAT YOU'RE THINKING #2" by Zafiriades-Tsouknidas-Pantazis and "THE CORPSE" by Zafiriades-Palavos-Petrou.